The unsung Michael Stuhlbarg, one of the best classical stage actors of his generation, finally gets the role he was born to play. And since I believe he's now in his late 30's, not a moment too soon! So kudos to Oskar Eustis at the Public for staking his flagship Shakespeare in the park production this summer on not a movie star, but just a damn good actor ready to play the role. Stuhlbarg has certainly gotten his due a little more of late--thanks to winning turns in The Pillowman and The Voysey Inheritance, where his tour de force performance anchored that whole wonderful production. I myself have been a Stuhlbarg fan since his Richard II at the Public back in '94, when he was just 22 or 23, just out of Juilliard. Even then, I knew here was that rare actor with a natural poetic gift and unassailable craft that could deliver a memorable Dane. So this is one I will gladly camp out for. Luckily, though, the lines will be short since he ain't been much on the TV. Oh, and they're bringing back last summer Diane Paulus Hair revival as a full production for the 2nd Delacorte show. POSTCRIPT: My later review of the Hamlet is here. 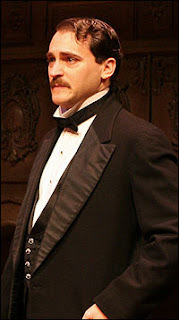 I was lucky enough to see Michael Stuhlbarg in the ART's Long Day's Journey into Night. He actually cut quite a close resemblance to the young O'Neill. He was fantastic in Pillowman, and I am really looking forward to his Hamlet. He is brilliant. I had a tiny role in a production of "Romeo and Juliet" at UCLA back in 1987, in which he played Romeo. It was a joy to watch him night after night. I saw "Hamlet" last night! What a tour de force! No one is better ... just a stunning performance. If Shakespeare had written "Hamlet" as a comedy then Mr. Stuhlbarg's interpretation would be the yardstick against which all others would be measured. Unfortunately, he didn't and this production is sabotaged by its almost constant metaphorical winking at the audience not to take the goings on seriously. In the heavy scenes where Hamlet is not present (Ophelia's madness, Laertes' return for revenge) it's difficult not to feel like the show has been interrupted by scenes from another play. When Hamlet soliloquizes it's hard to tell if he's on the level or if his tongue is buried firmly in his cheek. You know there's a problem when chuckles are heard from the audience as characters lie dying and bleeding profusely in the final scene! Well, I just came back from watching Michael Stuhlbarg as "Hamlet" for the second time and I would gladly...and will..wait another six hours, in the cold and in shorts no less, to watch this cast "interpret" what to many is a hard read into something that not only is almost natural in it's hearing and viewing as well as something that has substance. Mr. Stuhlbarg brings a humanity that in the midst of a tortured and tormented soul who was so oft betrayed would be offered up otherwise as piteous and well, depressing. My issue is with not the acting of Ophelia by Ms. Ambrose but by the direction that was given to her. If one is going to bring fire as Mr. Stuhlbarg did even as he portrayed "truth in kidding", to someone who is gauging for the relationship and attraction/chemistry between two characters...it wasn't the acting. It was how...demure and plain Ophelia was pre-madness, even in her terror-struck "what the heck is going on with my man?" speeches that honestly I can't see how a Hamlet in all his life and vigor did not have a counterpart in Ophelia, though there was a hint of it with the "may I lay on your lap" dialogue, and it has nothing to do with the "age difference" between the actors. What I did and do admire is Margaret Colin's Gertrude, because I have always wondered if the character was in on her second husband's deeds and while I've read some criticism concerning the harshness of the portrayal, as a writer it makes sense that if you give up part of your value and humanity and morals that hardness of heart and desperation comes. So anyhows, it was yet again a joy to experience something I rarely have and by Jove, I'll do it again! I thought Stuhlbarg was excellent- I really liked a Hamlet who wasn't so overcome with exaggerated melancholy so as to overshadow Shakespeare's ever present sense of humor. I saw it the second night and I'm going again this week. I hear there have been changes made to the production! I can't wait.